Now that it’s unofficially summer, it’s time to think about a few delicious wine cocktails. While cocktails made with wine are by no means a new creation, they are enjoying a healthy revival as mixologists continue to craft better beverages and experiment with a variety of spirits, including wine as a direct route to making the traditional cocktail more food-friendly. Amazingly, wine cocktails were at their height in the early 1900s with both table and fortified wines used as the drink base. That is until Prohibition took its toll on cocktails of all varieties. Today, these wine concoctions pair deliciously with food, friends, and festivities of all kinds. Plus, wine cocktails are inherently more relaxed because you can drink them from a straw. Even a bendy straw. Sparkling wine cocktails tend to be all-time favorites with practically everyone. Typically they are a snap to make, bring festive bubbles to the mix, pair well with a variety of food and are just downright delicious. There is the traditional Mimosa, a brunch cocktail, made with champagne or sparkling wine and orange juice, or the Bellini. The Bellini is perhaps Italy’s most famous wine cocktail, based on Prosecco and white peach nectar. Peaches and Prosecco, it doesn’t get much easier (or yummier) than this. For a twist on sparkling cocktails, give this Gewürztraminer Agave Ginger Ale a try. Your mouth will explode with flavor when you use fresh ginger. Perfect wine cocktails balance sweet, spice, sour and savory. For this one we selected wines from Chateau Ste. Michelle, Columbia Valley, Washington. This wine is a beautiful blush sparkling wine, with essences of berries in the nose and on the palate. The initial impression is dry with a soft and fruity aftertaste. The Columbia Valley Gewürztraminer is also n lush wine with expressive fruit and clove spice. It also has a lot of floral character, while maintaining the grape’s natural crisp acidity. Put sliced ginger and agave in a cocktail glass and muddle with a wooden spoon until ginger pieces are fragrant. Add 3 oz Gewürztraminer. Stir. Strain into a sugar-rimmed cocktail glass with ice. Top with Ste. Michelle Rosé Brut. 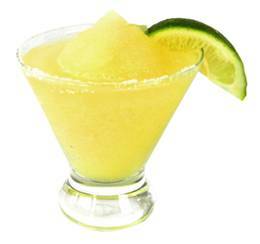 If you are a Margarita lover, a Pinot-Grita is the perfect sip to kick-start the spring into summer season. This unique twist on the traditional margarita adds a kick of bright lime to the Pinot Grigio’s clean citrus flavor. With aromas of nectarine and fresh peach, this Pinot Grigio is crisp and refreshing, creating a light and invigorating cocktail perfect to enjoy with friends and family on a warm and sunny afternoon. For the Ecco Frutta, we used Ecco Domani Pinot Grigio. Ecco Domani translates to “Here’s tomorrow” in Italian, and this IGT Pinot Grigio’s light citrus and delicate floral aromas,tropical fruit flavors and a crisp, refreshing finish are perfect for the Ecco Frutta—a white wine cocktail where mango and kiwi marry for summer sipping. Not into super-sweet? We love this cucumber wine cocktail. It’s both refreshing and savory because the mint and lime add a slightly sour balance the drink. For this drink we used Robert Mondavi ‘s Fume Blanc, a blend of 87% Sauvignon Blanc and 13% Semillon. This wine is very aromatic with lush, floral and tropical notes ntertwined with lime zest, wet stones, fresh herbs and lemon curd. It has an intriguing, textured minerality, with lingering fresh lime and lemon verbena finish making it a perfect wine for this cocktail. Here again, we went with an affordable Moscato because of its aromatic floral scents, and the light, sweet flavors of orange marmalade and marzipan. Normally, Moscato pairs nicely alongside cheeses and lightly sweet desserts, including creamy brie or ripe figs with honey. With the addition of Basil the drink becomes a bit more savory. Blend all ingredients, except wine, together. Strain into tall glass with ice. Pour over moscato. Add a bendy straw. Okay beer lovers, If you feel it’s just not a cookout without the beer, don’t fret. Here’ a refreshing summer drink for you: the Ginger Shandy. In a large pitcher, combine the Hoegaarden with the ginger beer. Stir in most of the lemon slices and mint springs. Fill 6 rocks glasses with ice. Add the remaining lemon slices to the glasses and pour in the shandy. Garnish each drink with a mint sprig and serve. As you can see, the best summer drinks are full of flavor — they can be subtle, fruity, or just plain refreshing. Enjoy these alcohol-enhanced summer cocktails and drinks during parties, weekend cookouts, or while hanging out with a friend. On Tuesday, November 2nd, 72 lucky guests heard Rodrigo Redmont, the winemaker for Talamonti and Rubino wines, speak about his wines at Branches’ Southern Italian Dinner hosted by Barbara Longue of Cotes de Longue and John Lombardo of Branches Catering. The evening began with flutes of Drusian Prosecco Brut—a rich, beautiful Valdobbiadene Prosecco with fine, tiny bubbles. This Prosecco aroma has a toastiness with generous notes of peach, apricot, almond and crushed stone. It has a thicker, creamier consistency offers up lingering fresh orchard fruits: green apple, peaches, pears, citrus, and fresh vegetables accompanied by a pleasing note of bread on the medium crisp and dry finish. This little gem was served with a selection of Italian Cheeses from “Cheese on Main” in Ocean Grove. Cheese on Main’s owner Susan Morris says her tiny shop on Main Avenue in in Ocean Grove is only 9 feet wide, but it’s stocked with 200 lovely cheeses from the far corners of the earth. On Tuesday she was serving five Italian cheeses. The first cheese was a Rocchetta from the Piedmont region of Italy. It was a lovely and creamy robiola combining the flavors of goat’s, cow’s and sheep’s milk into a harmonious balance of flavor. Dense, semi-soft and smooth in texture, Rocchetta is a very approachable and decadent cheese. Paired with the Prosecco it was delicious. This particular cheese has an affinity for a full range of wines and makes an excellent pairing partner;especially with wines from Piedmont, such as Dolcetto, Barbera or Barolo. One piece weighs approximately 9 ounces and costs around $14.50. Next was Pecorino Tartufo, this is an an old style of Umbrian pressed sheep’s milk cheese. The cheese flavor is unique because the buttery nutty flavor is enhanced by the addition of aromatic black truffles. Susan explained the cheese has a long shelf life, but cautioned that it could become “addictive” and is usually consumed rather quickly. If the reaction by the guests was any indicator, she was right. Not only did it make a festive pairing with Prosecco, it can be a versatile partner for many wines, from tart light whites to the bigger jammy reds. She offers this cheese for $13 per half pound. The third cheese, Gorgonzola Dolcé from Lombardy, was gooey, creamy, soft, and almost spreadable in texture. Gorgonzola Dolcé is made from pasteurized cow’s milk, then aged for 3 months and is considered the sweeter gorgonzola. It was very creamy, milder and much softer than its Natuale or Piccante counterparts and pleasantly pungent. At $9.50 per half pound it was exquisite with the Prosecco. From Sardegna came an ivory, hard, goat’s milk cheese: Pantaleo. This was full-flavored treat with a remarkably lemony flavor that morphed into a rich, butternutty flavor. It has the familiar herbal and white pepper flavors of a goat cheese, but with a slightly lighter finish that it almost doesn’t taste like goat cheese. It would be perfect shaved over warm vegetables or paired with a drizzling of light honey. $9.50 /half pound. The last cheese was a match made in heaven with the Drusian Prosecco: a dark rind Artisinal Ubriacco Prosecco. Ubriacco Prosecco means “big fat drunk” in Italian. Ubriacco is a raw cow’s milk cheese from the Veneto region, the same region where the Prosecco grape grows. During the maturing prcess it is covered by Prosecco grape must (skins) and washed with Prosecco, giving the cheese the sweet, delicate wine aroma and complex finish. Susan said this cheese is perfect during autumn months while its flavor is fresh, uplifting, and subtle. It can pair nicely with Pinot Noir or Moscato as well. $15.50/half pound. Then it was to the dining room and first course of Escarole and Beans, Peasant Style. The balanced flavors of the escarole and beans in this soup topped with a little parmesan cheese were delightfully mellow and made all the more delicious by the Talamonti Trebbiano d’Abruzzo v. 2009. The light and bright flavors of apples and peaches in this traditional white Trebbiano brought out the fresh vegetable nuances of the soup. It was a satisfying pairing and perfect for a cool November day’s meal. We had just finished the very last drop of Trebbiano and discreetly licking our bowl when scents of Bolognese sauce filled the air and the empty soup bowls were replaced with plates of heavenly Radiatore Pasta with Lamb Bolognese. As the guests dug into the plates of pasta, servers poured Talamonti Modá Montepulciano d’Abruzzo v. 2008, a medium-bodied red that stood up nicely to the lamb flavors and blended seamlessly with the Bolognese sauce. Montepulciano wines tend to be softer and more accessible than Chianti or Nebbiolo with their cherry, plum, and rasberry aromas/flavors—and this intensely fruity Montepulciano d’Abruzzo was a soft wine, with just a hint of acidity and tannins that make it hard to miss with pastas and red sauce or almost anything else at the dinner table. Now we were definitely becoming full, cheese, soup, pasta and another course to come. Could we do it? Yes, the next course was Osso Bucco, cross-cut veal shanks braised with vegetables, white wine and broth served with polenta. How could we resist? The veal was perfect and the polenta light and creamy, talk about comfort food, this was yummy. For this course, guests were treated to two different wines. The first, a purple Talamonti Tres Saggi Montepulciano d’Abruzzo v. 2008 was a rich Montepulciano blend. The addition of 30% Merlot provided weight and some complex notes of berry, cherry, blueberry, coffee, vanilla and elegant oak. It was a seamless pairing. The second wine was Rubino Punta Aquila v. 2007 a Primitivo. The violet reflections of this deep red wine were complemented by an intense bouquet and spicy aroma that followed through to the palate. When tasted on its own, one table mate commented it seemed too big and that it would overpower the dish,she claimed she didn’t like it. Yet when she heded the advice of the winemaker and when sipped with the polenta and a bite of osso bucco, she found the boldness was tempered and the tannins smoothed to a delightful finish. Then this full-bodied wine conveyed a velvety warmth of home. It was incredible and a nice change from the “usual Cabernet”. We barely had room for the dessert, Zeppole laced with Winter Pears and drizzled with Sabayon. This was paired with Angioletta Moscato, a slightly effervescent Moscato with flavors of peach, apricot, and a touch of honey, this dessert was aperfect ending to a perfect meal. All of the cheeses are available at Cheese on Main, 53 Main Avenue, Ocean Grove, NJ 07756, Phone: (732) 775-1530. Sadly, she doesn’t yet have a web site but you can phone or visit her for cheese advice. Wine I Like It had it’s most recent tasting at Branches Catering in West Long Branch NJ September 39, 2010. This month the ten wines represented several different wine regions rather than just one as we had done in previous months. The wine regions represented: California, Hungry, Chile, South Africa, and Italy. Wine I Like It is a not for profit blind tasting group designed to help people discover the sorts of wine they like, and at the same time, to help winemakers, distributors and retailers, determine what consumers look for in their wines. It is especially helpful for launching new wine products and or relaunching a once popular brand that has grown a little “tired”. The Wine I like It tasting panel group consists of more than 300 members who come from all walks of life and backgrounds. The ages range from 21 to 70-plus. Some are neophytes in the wine world wanting to learn more, others consider themselves wine experts and then there are the members who just love wine and are looking for something new and different for their wine rack. The group is nearly evenly divided between male and female. For each tasting panel, members are selected based on the day of the week they stated was the best day of the week for them to come and taste. All of the members for that particular day of the week are invited to attend the tasting, but only the first thirty to reply are accepted for the tasting, the next five are wait listed in case of cancellations, all of the other respondents are given first call for the next blind tasting date. Each member of the panel is provided with a blank form with space for each of the ten wines being tasted. Here they are asked to record their initial impressions of the wine as to whether they like it or not based on a 0 – 5 scale with 5 being I like it a lot. There is also space for them to write notes, let us know how much they are willing to pay for this wine in a retail shop, and, if they like, guess they type of wine and wine region. The panel members are introduced to one another and then asked to refrain from speaking about wine or their impressions of each wine during the tasting so as not to influence one another. The 25 tasters began the evening with a light, sparkling Moscato before settling down to begin the sampling. The top wine this month was Dardano Zara Rosso 2008. Zara is a rich deep nebbiolo bend from the Langhe area of Piemonte in Italy. With 119 out of 145 points it was the clear leader. The comments ranged from “Nice texture, full-bodied, smooth, rich cherry flavors” to “dried meat taste”. “Big and complex” was noted by several of the panelists. One wrote “Crisp flavor, it would be nice with a steak.” Another stated, “Best of the reds!” While others put it simply: “My favorite!”, “Delicious!”, and “Yummy!” This wine normally sells for around $17 and the tasting panel was on track estimating they would pay up to $18 for a bottle. There was a tie for the number two position, these two wines couldn’t have been more different from one another, yet both wines scored a total of 103 points out of 145. This Bliss Cabernet Sauvignon, 2008 from California was one of the two and the other came from an area approximately 7000 miles way in Hungary, In Vino Veritas Tokaji Furmint Félszáraz (Medium-Dry) 2007. Most of the panel surmised This Bliss was a California appellation Cabernet Sauvignon. One taster simply drew a smiley face for her comments, but most wrote the wine was “Nice aromas, big, jammy, slightly peppery and spicy with a smooth finish” One proclaimed it was amazing and another simply said “Excellent! I want barbecue! This Bliss normally sells for around $12. Here, the panel was generous, they said they would pay $17 for it. Furmint wasn’t a grape most had tasted before, so many guessed it to be a German dry riesling or a gewürtztraminer from Germany or Austria and were surprised to discover the wine was Hungarian. The comments were unanimous: “Clean, crisp, fruit flavor of pears. Good and sweet”. One said it reminded him of salt water taffy. Another commented that it was “Nice and crisp fruit—good with Indian or Thai food” One declared it the favorite wine of the evening. The panel was on target when it came to price, they said they would pay between $15 and $16 and this wine is normally offered for sale at around $16. Coming in with the third highest score, but still number four was Stellekaya Boschetto 2004—a red blend from Stellenbosch, South Africa. Boschetto is a blend of 40% cabernet sauvignon, 40% merlot, 10% shiraz, and 10% sangiovese. Most of the tasters commented on the smoky aromas and flavors. One taster immediately guessed she was drinking a South African wine and thought it might be a cabernet/merlot blend. References were made to the scent of “forest floor” and “band-aids”. Many agreed it was “layered, earthy, and complex with smooth tannins.” One commented the wine was “Easy to drink and good for a party”, while another stated, “Great flavor, well-rounded. I’m in love!” Here, our tasting panel underestimated the cost of this wine—$17 as opposed to the normal retail price of $31. Rounding out the top five was Grand Sasso Montepulciano d’Abruzzo 2008 from Italy. Nearly all noted the aromas of violets and strawberry were noted. One taster opined that the wine had “lots of fruit on the nose, but drier on the palate than I thought it would be.” One person suggested “Light-bodied red —would be great with fish, pork, or chicken.” Another wrote: “Dry and flavorful—I like it!” The average price was estimated at $15.75—close to the $15 retail price. While most of the tasters were unsure of the style and type of wines they were drinking, one taster correctly identified seven of the ten wine varietals and four of the wine regions. It was a fun and informative session for all panel members. The next Wine I Like It Blind Tasting is scheduled for the end of October 2010 and WineILike It is actively seeking to add panel members. But is knowing that basic rule enough? How does one know which wine to select? The short answer is: the one that you will enjoy the most. But what if you don’t know what you’ll enjoy the most with your meal? Should you pick red? Or white? First, red wine is a natural accompaniment to grilled meat. The secret is knowing which wines to drink with which dishes. Take a grilled steak, the hearty flavor of steak is always enhanced by the right wine. Many reds taste better paired with beef­—or lamb—than they would if consumed without food (Chee-tos don’t count as a food group for this article. Note: Champagne works well with Chee-Tos). A simply-grilled steak pairs beautifully with a full-bodied red wine. A full-bodied Cabernet Sauvignon with black currant, coffee and dark chocolate notes and a long finish would balance nicely with steak. The tannins in the wine combines with the protein in the meat to create a lush, flavorful taste, and the steak’s proteins soften the Cabernet’s tannins. Summers Adrianna’s Cuvee from Napa Valley, Yalumba Cabernet Sauvignon 2007 from South Australia, Los Vascos Colchaugua Valley, Cabernet or Montes Alpha Cabernet Sauvignon, both from Chile are all affordable good choices. Not in the mood for Cabernet? A California Merlot or a Hermitage like Guigal Crozes Hermitage 2006 from France’s Rhône Valley are also good choices. Although Cabernet Sauvignon will pair well with one of the most delicious steaks available— Ribeye or a Delmonico Steak, a Merlot would be better suited. A favorite is Twomey Merlot 2005 — a voluptuous, robust and balanced concentration of black cherry, blackberry essence, wild game and freshly ground black pepper. This is a full-bodied and velvety wine, with fine-grained tannins and an extremely long finish. This Merlot will continue to give drinking pleasure through 2018, and it will delight you and your dining companion(s) today. This is a BIG, rich flavorful wine and it will leave you wanting more. If you want to add a little spice to your ribeye, cajun ribeye, or New York Strip Steak, a spicy Zinfandel with its blueberry and blackberry flavors is a match made in heaven for this gorgeous marbling and mouth-watering aroma of beef at its best. Try The Phantom, Bogle Vineyard’s Zinfandel blend. This succulent full-bodied blend combines lush blackberries and blueberries with the fierce spice essences of black pepper, cinnamon and nutmeg. A full-bodied, peppery California Zinfandel is always the first choice to accompany a spicy steak, such as a “steak au poivre”. Steaks that are highly spiced or one marinated in a spicy brine, are best paired with a spicy wine. If you would rather not have a Zin, a fruit-forward Merlot, with plum, blackberry, and clove is another alternative. The fruit flavors, when blended with the spicy steak, will appear sweeter and temper the pepper. Chardonnay lovers, take note…“steak au poivre” is the steak to pair with a lightly-oaked, ripe, crisp Chardonnay. The Chardonnay should be rich with apple, pear, and citrus flavors. Try Alph Omega Napa Valley Chardonnay 2006 with its fresh entrance evolving on marzipan, Meyer lemon, apples, yellow raspberry and pear, with a strong minerality and lingering crisp acidity. This 94 point* rated wine will surprise you—especially the fact that it is long-lived, it will continue to drink well through 2015. The classic porterhouse is a cut that offers two unique steak flavors in one. The rich taste of the meaty sirloin strip and the tender, buttery-soft filet mignon. The larger filet mignon portion, is sure to satisfy your beef-lover’s appetite, and it just calls out for a medium-bodied Pinot Noir. The rich silkiness of the wine enhances the filet’s soft texture. Pinot’s flavors of red cherry, strawberry and smoky, earth tones shine in Castle Rock Mendocino, California Pinot Noir. For a French twist, Joseph Drouhin Vero Pinot Noir 2006 is not only a delicious Burgundy, it’s affordable. Prime rib becomes more of an occasion when paired with a Syrah/Shiraz. If you want a fruity Shiraz, look to Australia’s Peter Lehmann’s Barossa Shiraz. The nose is typical of Barossa Shiraz, with scents of dark plums and chocolate. There are also notes of sweet cedar and a hint of black pepper. The palate has a good depth of dark berry flavors with a touch of savory fruits and a good tannin structure in harmonious balance to the fruit. This wine does very well with both steak and lamb. If you want a more elegant and refined syrah look to France’s Rhône Valley. 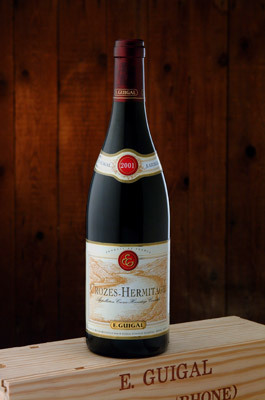 The Guigal Crozes Hermitage 2006 mentioned earlier is a structured, tannic wine. This well-made, medium-bodied 2006 is a classic example of the appellation at a high level of quality. This Crozes-Hermitage is richer, and more textured, offering peppery, tapenade, and cassis scents with an undercurrent of minerals. The spicy, fine red berry and cherry flavors mingle with refined tannins thus lending support and a focused peppery quality. All of this leds to a strong finishing snap. Somewhere between the two, is California’s Pedroncelli Alexander Valley Syrah . Pedroncelli’s Syrah has rich aromas of ripe berry and black pepper spice with concentrated flavors of blackberry, plum and licorice. This Syrah has well-balanced tannins providing structure. Expect this delicious wine to take on complexities for the next 5-7 years. Italy’s Rocca della Macie offers an elegant, an innovative blend of Sangiovese and Syrah called Sasyr. This wine is velvety smooth, supple and vibrant, with fruity aromas cherry, blackberry and raspberry. It is intense and complex and as the winemaker likes to say “it will introduce you to an array of flavors beyond your wildest dreams.” Needless to say, Sasyr is both easy drinking and quite elegant with steak. For something different, a Petite Sirah, is a good choice. No, it’s not a smaller version of Shiraz/Syrah, it’s a hybrid, making it a different grape. Durif is a cross of Peloursin and Syrah. This grape makes a dark colored, tannic wine with blackberry, plum fruit and mushroom flavors—perfect for pairing with prime rib, a T-bone, or a sirloin steak. Try David Bruce Central Coast Petite Sirah 2006. This Sirah exudes bright, spice-tinged, jammy fruit, earthy mushrooms, and dense blackberry, blueberry and white pepper aromas. The wine offers a supple and balanced feel full of red and blueberry fruit with hints of cassis and firm tannins. Altovinum’s Evodia Old Vines Garnacha 2008 will add some peppery goodness to any steak. Evodia is the Greek word for “aroma” and this red has very fresh, straightforward scents of raspberry and blackberry, plus cracked pepper. Juicy and tannin-free, with spicy berry and pepper flavors and a gentle mineral lift. Easy to drink and a superb value, with a good finishing bite— you won’t need to reach for the pepper mill when you pair grilled meat with this one! Okay, your steak is slathered in barbecue sauce, what do you drink? Chianti. Chianti is the traditional wine to accompany red tomato-based sauces. That’s why Chianti is the preferred wine for pizza or to drink with spaghetti and meatballs. The high acid content in Chianti balances well with the high acid content in red sauces, such as barbecue sauce. Marchesi de Frescobaldi’s Nippozzano Riserva Chianti Ruffina proves itself year after year. This classic Chianti is from the sub-region of Rufina in Tuscany. The smooth, supple wine is full of red fruits, violets, cinnamon spice, fine tannins, and gentle cedar complexities that lead to a beautifully fine tannins a clean finish. Chianti is the traditional wine to accompany red tomato-based sauces. Serve a red Bordeaux with grilled lamb steak. A smooth, subtle Red Bordeaux, such as Chateau du Taillan Cru Bourgeois Superieur Haut-Medoc 2005 is an ideal companion to grilled lamb. A Spanish Rioja such as El Coto Rioja Crianza also pairs well with grilled meat. Many classic examples exist of food and wine pairings that are tried and true: grilled steak and Napa Valley Cabernet Sauvignon or grilled lamb and red Rioja. These are reliable, low-risk ventures that will likely result in an enjoyable overall dining experience. Just remember to open these wine 20 minutes prior to mealtime to allow for the flavors in the wine to fully develop.